Bad: Feels like an unfinished, cheap product. There have been plenty of sports games throughout the years, and tennis games are no exception. Mario Tennis, Top Spin, how much can you name from the top of your head? Tennis World Tour promises to be more globally aimed. With a career option and a visit to different countries, you strive to be number one in the world. In Tennis World Tour, you make your own story. 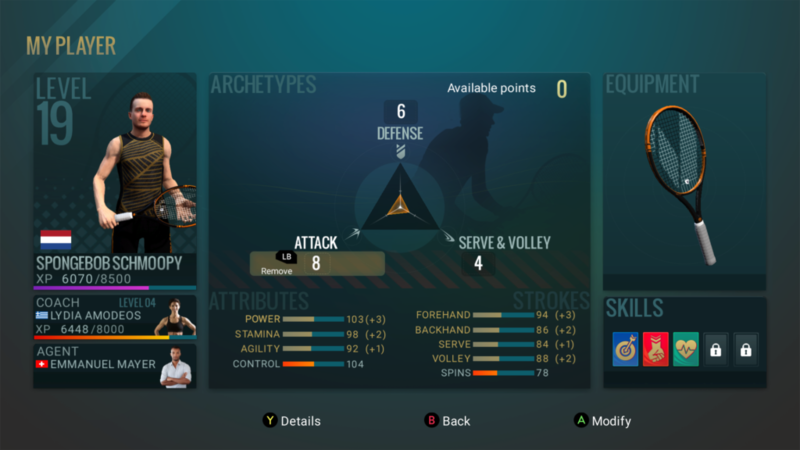 At the start, you get to create a character with (limited) customization options, and you begin your career with your chosen champion in an effort to become the number one in the world. There is no other real storyline, nor is there any conversation between you and others. It’s just playing tennis on venues around the world. Overall, the graphics seem to be fine when looking at the animations. Then you notice some glitchy animations in-between where a character just misses a ball. Then you ask yourself why the court you play in is feeling so bland and empty. Looking at the characters surrounding the field such as a video crew and ball boys who don’t move an inch you start to feel like something is a bit unfinished. What’s going on there in the crowd? Are those people even alive? Then you even start to notice you have to play against a character who has your face as well. There are not too many different players. Graphically the game feels rather cheap. Perhaps the best part is the change of scenery when you play at different locations such as an indoor gym. In Tennis World Tour there is not much sound to be spoken of. A fun fact: you can decide at your character creation how much your character will moan on the field. Here you choose between no moans, occasionally or a lot. Moans are also the main sound you will hear (which maybe is kind of like a real tennis match). Besides that, you will hear the crowd make some noise when a point is taken or when the ball hits the edge of the field but stays in. There are also commentators, but frankly, they are too silly to be taken seriously. Firstly, they also have a very limited response with few options that you will hear, and secondly, whenever they do talk it makes no sense. Most of the times it’s something like ”Wow, such power!”. Now imagine barely touching the ball and it will just make the other side of the net. Hearing ”How does he have such strength? !” as a comment makes the entire game feel like a silly parody, while this definitely isn’t the intention. 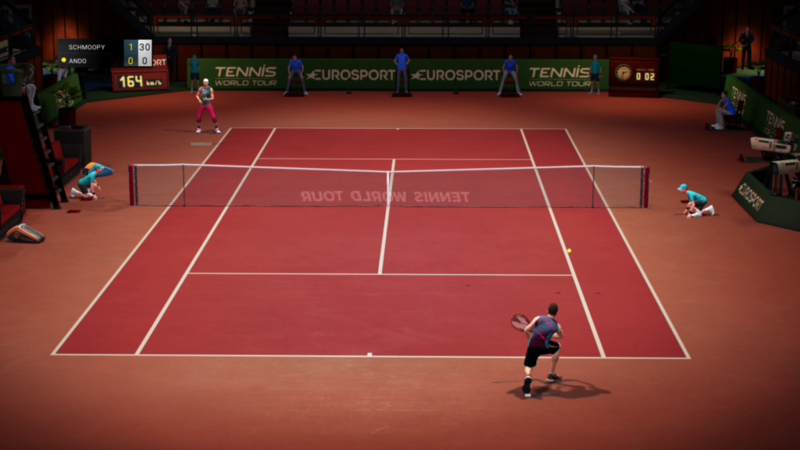 Being a tennis sports game, it’s clear what you can expect from Tennis World Tour. And for the biggest part concerning expectations, the game delivers. Sure the graphics and characters are rather bland and you might as well be playing on the North Pole when comparing the different fields, unable to guess the location you play at purely by visuals. But at least you can do the usual: the serving, rallying and the slightly different ways of passing a ball to the other side of the net. Rallying is the biggest part of a tennis game obviously, and there is some enjoyment and excitement to be gained doing this in Tennis World Tour. You can choose between exhibition mode (casual), career (increasingly difficult) to try and conquer the world, or multiplayer. Tennis World Tour tries to mimic real life advantages and problems as you play in career mode. Each month of your career you get to pick one option such as playing in a tournament which will take you to the field, meet up with a new coach that unlocks that coach, practice on your skills which will grant you a bonus in i.e. agility or power, or rest which will grant you 25% of your overall health back, making sure you don’t burn out. Besides that you can level up by doing all these things, and spend the leveling points on attributes that enforce you, picking skills that slightly help you, and spending money you earned on gear as you progress. Some gear is purely there for the visuals, other will actually improve the stats of your choice. It’s the basis of a good system, yet frankly put, none of it matters. If you want to buy different equipment, all it does is shifting around some points. As an example, if you buy a different grip for 2000 currency, you expect it to improve something. Yet it takes away two of your power points and adds two to your agility. By doing so, it’s rendering its own system pretty useless unless you truly believe your character should be the Hulk without speed instead of staying balanced and improving. Then there’s still an issue while playing. The game doesn’t give you that much freedom in the style you play. Most of the actions you take are programmed as a ”snap-to-grid” sort of element. If the ball comes, your character will get himself into position for the largest part of the return. When you want to hit the ball back in a certain direction, this doesn’t go very smooth. Sometimes it’s a lot of guesswork how the game interprets your controller inputs. The same goes for when you clearly want your character to walk in a direction or smash a ball but he simply refuses to do any action at all and seems to freeze in place. Especially after a 28 hit rally, this is very annoying and the worst feeling. 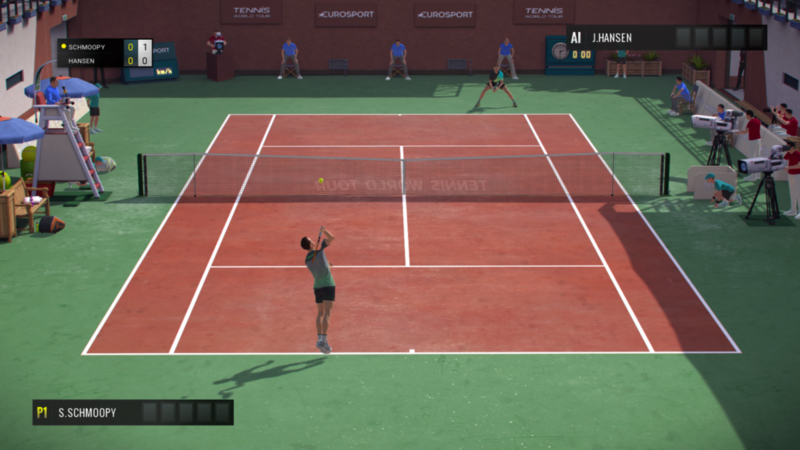 Even though the game itself can be enjoyable, the unfinished looks and lack of depth of something that’s called Tennis World Tour already destroy a lot of ambiance of the game. If you also look at the way the game is not following a player’s instructions and weird snap-to-grid type of gameplay, the game might be an addicting mini-game at best. 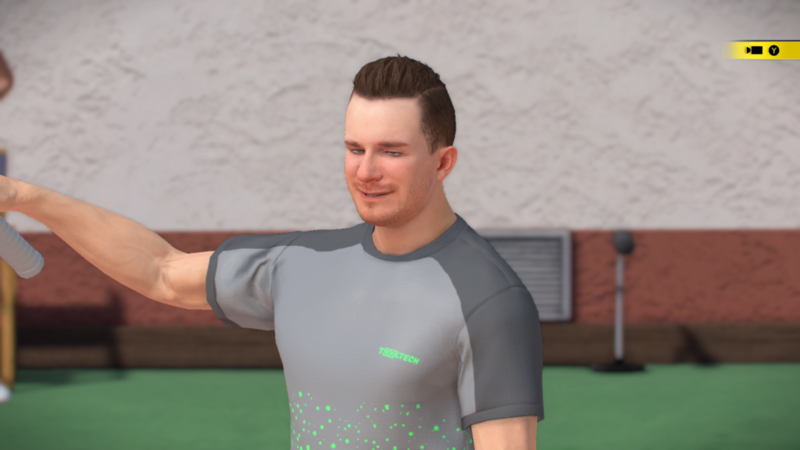 There’s so much to improve in Tennis World Tour, that compared to the good tennis games already out there, this is definitely not one of the best.